I’m sure by now you’ve heard of Gutenberg. No, not the project to digitise the written word. This is a new editing tool for WordPress. It’s had a lot of hype and there’s mixed opinions out there as to whether it’s going to deliver on expectations and provide the level of functionality that the WordPress community desires. In this post I’m going to provide an overview of what Gutenberg is, what it will do, how to install it and have a play and what the overall verdict is from the critics. If you’re a WordPress user you’ll know that it comes with a built-in WYSIWYG (“What You See Is What You Get”) editor for pages and posts. New blogging systems such as Medium and Ghost have raised the game of the editor interface. It’s probably about time that WordPress raise their game to meet them. WordPress is an open-source project and for awhile now many volunteers and contributors have been working on Gutenberg. It is named after Johannes Gutenberg, who invented a printing press with movable type more than 500 years ago. The existing editor is by modern standards a bit… clunky. It’s challenging to incorporate short-codes and HTML. Layout options are limited without knowing a bit of code or by using a theme that has built-in layout options. 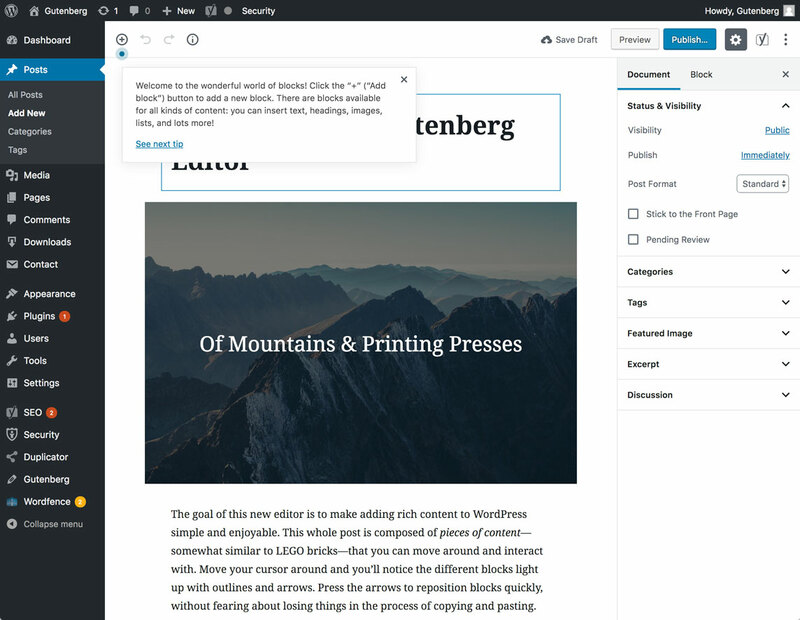 Gutenberg has been developed to provide users with a more flexible and functional native visual editor. 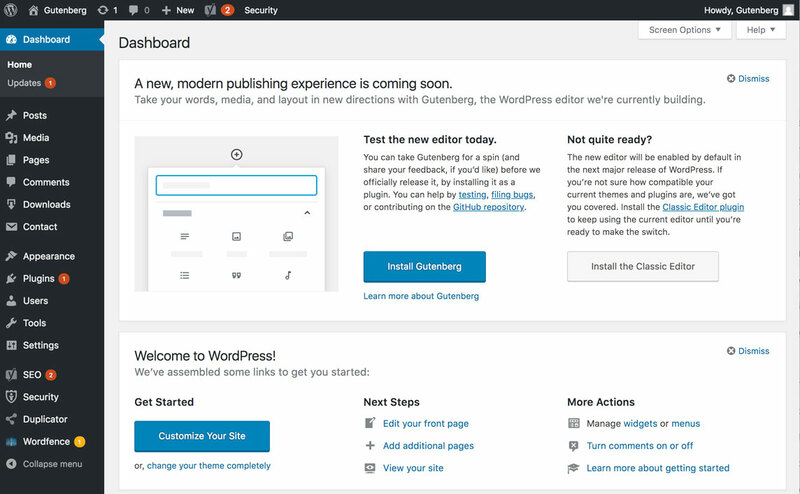 Gutenberg isn’t ready for release yet, but you can install a beta version from your WordPress dashboard. 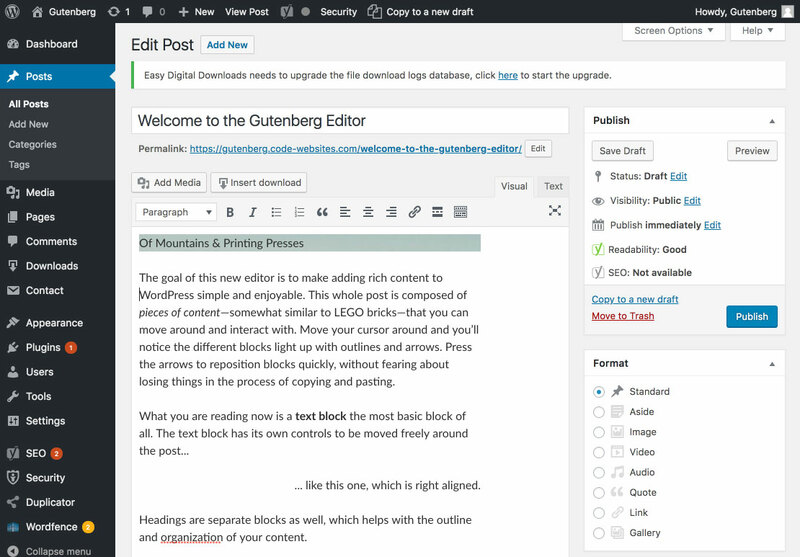 Gutenberg is set to be released with WordPress 5.0 sometime later this year. 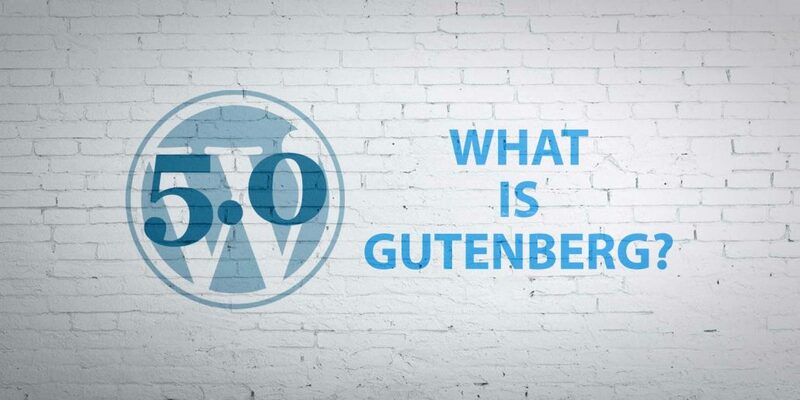 It’s expected that Gutenberg is going to have a significant impact on the WordPress community. Gutenberg isn’t just going to be a new editor for WordPress. Gutenberg is stage one of a three-pronged roll-out strategy. The second stage of the project will focus on page templates and in the final stage WordPress will become a full site customiser. This is exciting because it brings a major overhaul to WordPress which will help keep WordPress at the forefront of the CMS community and help maintain it’s No. 1 spot. But it is expected to have it’s limitations. Gutenberg won’t look entirely like a drag-and-drop website builder like Wix or Squarespace. Developers will still be needed to extend its functionality and create themes with extended layout options. Gutenberg will offer its users more functionality on creating page and post layouts with simpler tools that have more options and flexibility. There’s a number of new features users are excited about. The main one being “blocks”. Every item you add to a page or post will be a block whether it’s a heading, an image, a paragraph, a list or a video. And each block has its own settings. However, the perceived shortcoming of blocks is that they will only stack vertically, they cannot be placed horizontally. I don’t know about you, but I like to stack content elements side by side. It’s not expected that responsive columns will be included with the release but perhaps this will be addressed. Regardless, I have to say my first impression of the editor is a positive one. The installation process was simple, I just clicked install and then activate from the dashboard, in true WordPress style. I was then taken to a page where tooltips provided a quick tour of the features. The interface is very user friendly. A variety of content blocks were already added to this example page and I could instantly see how the blocks would improve upon the old editor’s layout features. Now, for me personally, I tend to use a visual editor plugin to extend the layout functionality. But your theme has to integrate with the editor you choose. For sites I work on that just use the native editor, this will certainly provide more options. This is good for businesses and bloggers that are budget conscious as they can still create awesome looking pages without the need for a premium or custom-built theme. But if you want your website to be designed from scratch, this editor isn’t going to be a big feature for you as I can’t see it replacing a plugin like Visual Composer or Beaver Builder. A cool feature that needs to be mentioned is the fact that you can reuse blocks. This is going to be very handy for those times when I create a content block and want to copy it elsewhere, saving me loads of time on the styling, formatting and content of that block if I need another one that is going to look similar. You can actually save any block as a template and then access it from a menu later on when editing another page or post. That will definitely be handy! I suggest you try Gutenberg out for yourself before it gets released. See if you like it and see if you can break it! Does it work on your site? When Gutenberg is rolled out, fear not – if it doesn’t work with your theme there will be an option to roll-back to the classic editor… for a while. But you might want to prepare your site to integrate with the new editor as a long-term plan. For that, you might need a seasoned WordPress developer – *cough cough* – you knew a shameless plug was coming! So to sum up, if you like modern editing interfaces like Medium, you’re going to love Gutenberg. It’s an easier to use editor with more screen space and less distractions. The blocks are easy to use and you’re going to find the responsiveness of your page layouts with this editor get a reboot. That’s great news for responsive websites using WordPress! Plus it’s easy to use for beginners. Backwards compatibility may well be an issue and this may actually create development work for website owners. It’s a mandatory new feature with WordPress 5.0 so be prepared to make the switch! Thanks for reading! And don’t forget to Contact Us with any questions or requirements for design and development on WordPress. https://code-websites.com/wp-content/uploads/2019/02/what-is-gutenberg.jpg 768 1536 Adam Cockerill https://code-websites.com/wp-content/uploads/2018/02/logo-CODE-websites-white-2-300x90.png Adam Cockerill2018-10-18 13:49:032019-02-26 04:52:02What Is Gutenberg?